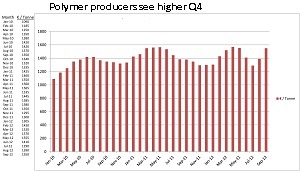 Several polymer producers reported higher quarterly profits for the fourth quarter, although most producers said that their full year results for 2012 fell below their 2011 figures, according to the pricing service of ChemOrbis. Producers active in other chemical markets said that their polyolefin business generally performed poorly relative to their base chemical business. Saudi Arabia’s SABIC posted a net profit of SAR5.83 billion ($1.55 billion) for the fourth quarter of 2012, an 11.3% rise compared to the company’s fourth quarter results for 2011 but down 7.6% from its third quarter results. For the full year of 2012, SABIC’s net income declined 15.5% to reach SAR24.72 billion ($6.6 billion). The company attributed the reduction in yearly profits to higher sales costs and lower sales prices for some products, which pulled down the company’s results in spite of the fact that the company achieved higher sales and production volumes and incurred lower financial charges in 2012. Global major LyondellBasell posted higher profits both for the fourth quarter and the full year of 2012 as strong profits from the company’s operations in the Americas help offset the operating losses seen in their European business. After posting a loss of $218 million in the fourth quarter of 2011, the company achieved a net profit of $623 million in the fourth quarter of 2012. For the full year, LyondellBasell’s profits rose from $2.14 billion in 2011 to $2.83 billion in 2012. The company reported that profitability in their North American olefins and polyolefins business more than doubled over the same period of last year to reach $693 million in the fourth quarter, helping to offset steeper losses outside the Americas. The company’s olefins and polyolefins business outside the Americas witnessed an operating loss of $94 million in the fourth quarter of 2012 after the same segment had recorded a loss of $73 million for the same period of 2011. Following a similar trend, Borealis recorded a stronger net profit in the fourth quarter while posting weaker profits for the full year. The company’s fourth quarter profits rose from €58 million in 2011 to €100 million in 2012. For the full year, the company’s profit’s slumped from €507 million in 2011 to €480 million in 2012. The company attributed their strong financial performance to high growth rates in its fertilizer business as well as support from its Borouge joint venture in the United Arab Emirates. These factors helped offset low growth and low margins in the European polyolefins industry, with the company adding that they did not expect the outlook for European polyolefins to improve over the short term. Malaysia’s Petronas also witnessed higher fourth quarter results while recording weaker profits for the full year. Petronas’ recorded a 12% increase in its fourth quarter profits to MYR988 million ($313.5 million) in 2012. For the full year, Petronas’ net profit slumped 11% from 2011 to reach MYR3.84 billion ($1.23 billion). In the olefins and derivatives segment, Petronas’ net profit plunged 89% in the fourth quarter to reach MYR70 million ($22.5 million) and its full year results for the olefins and derivatives segment dropped 37% to MYR2.08 billion ($670.5 million). Helping to offset weaker results from its olefins division, Petronas reported that profits in its fertilizer and methanol business tripled in 2012. German major BASF posted lower profits for both the fourth quarter and the full year due to poorer performance from its chemicals segment. The company’s fourth quarter profit was down 13% from 2011 at €980 million. Profit for the full year slipped 21% from 2011 to reach €4.88 billion. EBITDA from the company’s chemical business fell 24% to €2.41 billion due to lower margins as well as shutdowns at its Ludwigshafen and Port Arthur, Texas facilities. Helping to offset lower performance from the chemicals segment, the company reported that earnings from its oil and gas division rose 81% to €4.72 billion.